It is estimated that 20% of irrigated land is negatively impacted by salt and 1% to 2% of irrigated land is lost each year due to the accumulation of salt. Salt, particularly sodium chloride (NaCl), negatively affects plant growth in several ways. The accumulation of salt in the soil restricts water movement into the plant (osmotic stress) and the accumulation of sodium ions in a plant cell interferes with metabolic processes (ionic stress). Eutrema (Eutrema salsugineum), a small crucifer native to the seashore saline soils of Eastern China, is a halophytic relative of Arabidopsis. Eutrema is emerging as a model for understanding plant adaptation to soil salinity. Eutrema does not require salt for optimal growth but is able to survive in conditions that kill most crop plants and its tolerance does not rely on specialized morphological structures. In Arabidopsis, the SALT-OVERLY-SENSITIVE (SOS) pathway functions to prevent the toxic accumulation of sodium in the cytosol when plants are grown in salt-affected soils. 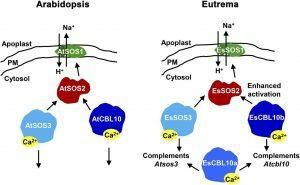 In this pathway, the CALCINEURIN B-LIKE10 (AtCBL10) calcium sensor interacts with the AtSOS2 kinase to activate the AtSOS1 plasma membrane sodium/proton exchanger. CBL10 has been duplicated in Eutrema, and this provides a unique opportunity to functionally test the outcome of gene duplication and its link to plant salt tolerance. Monihan et al. (10.1104/pp.18.01400) now report that the down-regulation of the duplicated CBL10 genes (EsCBL10a and EsCBL10b) in Eutrema decreased growth in the presence of salt and, in combination, led to an even greater decrease, suggesting that both genes function in response to salt and have distinct functions. Cross-species complementation assays demonstrated that EsCBL10b has an enhanced ability to activate the SOS pathway while EsCBL10a has a function not performed by AtCBL10 or EsCBL10b. The duplication of EsCBL10 appears to have increased the calcium-mediated signaling capacity in Eutrema and the duplicated genes conferred increased salt tolerance when expressed in salt-sensitive Arabidopsis.